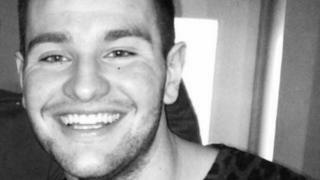 A man has been convicted of murdering a nightclub reveller amid a row over the venue's electronic punchbag. Daniel Baird died after a dispute between two groups of men spilled onto the street outside the Forge Tavern in Digbeth, Birmingham, in July 2017. A passing Google Maps driver tried to distract the groups but ended up taking the injured Mr Baird to hospital. Killer Carlton Donaldson will be sentenced at Birmingham Crown Court on Thursday. The 24-year-old of Minstead Road, Erdington, was also convicted of wounding with intent, attempted wounding, violent disorder and possession of an offensive weapon. Sashon Brown, 25, of Woodington Road, Sutton Coldfield, was found guilty of violent disorder, and possessing an offensive weapon. The court heard Brown got into a row with Mr Baird's friend Dale Scott. who took a swing at the pub's punchbag machine. Pub CCTV footage showed Brown holding a blade next to Mr Scott. The prosecution said Mr Donaldson later pursued Mr Scott and his group into Fazeley Street after the pub closed in the early hours. Mr Baird and Mr Scott were stabbed near a bus shelter at about 04:20 BST on 8 July and were taken to hospital by Google Maps operator Amrith Tlukdar. Mr Baird died from a single 2.3cm (1in) stab wound to the heart. Mr Scott was stabbed in the back. Prosecutor Paul Curtis QC described the incident as a "stabbing spree". Speaking after the convictions, Lynne Baird said: "It feels unreal that he's never, never going to come back and the only time he did come back was nearly 10 weeks later and he was in a coffin..."
Sister Kerry Sheehan said losing her brother was "so painful". Mr Scott, 29, of no fixed abode, and Sean Spooner, 28, of Deelands Road, Rednal, were both cleared of possessing an offensive weapon and violent disorder.